Captain Eoin Morgan made another half-century and Adil Rashid claimed 4-36 as England went 2-0 up in their series with Sri Lanka following a seven-wicket win in a rain-reduced third one-day international. Inclement weather in Kandy meant the contest was only 21 overs a side and though Sri Lanka were 57 without loss when batting first, Rashid and Tom Curran (3-17) helped restrict them to 150-9. The tourists then cruised to that victory target with 15 balls to spare as Morgan and Ben Stokes, who were unbeaten with 58 and 35 respectively, saw England home after Jason Roy had laid the foundations with a 26-ball 41. With no result possible in the first ODI and England winning the second on the Duckworth-Lewis-Stern Method, anything other than a Sri Lanka victory in Kandy on Saturday will ensure Morgan's men take the series. Sri Lanka's openers had started in impressive fashion when play finally began as Niroshan Dickwella and Sadeera Samarawickrama smashed 45 off the initial four-over powerplay. The partnership was at 57 when England finally made the breakthrough, Dickwella (36) launching Curran's back-of-a-length ball to mid-off where Chris Woakes claimed the catch at the second attempt. 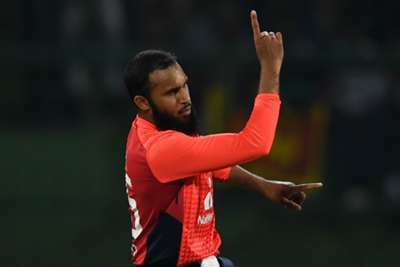 Kusal Mendis then failed to pick Rashid's googly in the next over to depart for a third successive ODI duck and the progress of Samarawickrama and captain Dinesh Chandimal was slow. Aside from Chandimal (34), Dasun Shanaka (21) was the only other Sri Lankan to make double figures as Rashid, Curran and some fine fielding that led to two run outs gave England a modest target. Their effort was given a boost when Lasith Malinga bowled two wides from his first three balls in an opening over that cost 17. And though Jonny Bairstow lasted just two balls and Joe Root was out for eight - Amila Aponso accounting for both men - a 46-run stand between Roy and Morgan ensured England always looked comfortable, even when the former was pinned in front by Akila Dananjaya following a review. Stokes came in and mimicked team-mate Jos Buttler's ramp shot for one six and Morgan, who made 92 in the second ODI, reached his fifty with one of his seven fours. And it was Stokes who scored the winning runs when he launched Aponso back down the ground for his second maximum.